Panoramic views are probably the first thing that comes to mind when you think about the Grand Canyon, but Grand Canyon National Park is much more than just a pretty view. There are so many places to see and so many things to do in and around Grand Canyon National Park. 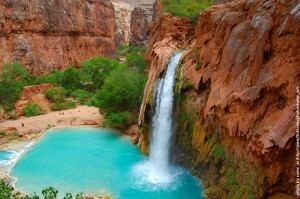 Riding the historic Grand Canyon Railway; rafting the Colorado River; soaring over the canyon in a plane or helicopter; exploring historical landmarks and native sites & villages; or embarking on an extraordinary hike to otherworldy destinations like Havasupai Falls... whatever your interest is, Grand Canyon has the goods to make your vacation come alive! Check out our list of popular past-times in Grand Canyon National Park! The Grand Canyon Railway is a passenger railroad which operates between Williams, Arizona, and Grand Canyon National Park South Rim. 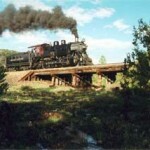 Grand Canyon Railway is one of the staple attractions of Grand Canyon National Park. The Grand Canyon Railway was bringing interested travelers from all over the world to stand on the rim of the awe-inspiring canyon before there were paved roads, hotels, restaurants... even before the canyon was made a national park. The Grand Canyon Railway made its first journey to the South Rim in 1901, long before Arizona was even recognized as the "Grand Canyon State". Although much has changed since that time, the Grand Canyon Railway still carries the nostalgia that it had over 100 years ago. A journey to Grand Canyon National Park aboard the Grand Canyon Railway is not only a trip to America's most recognized spectacle, but a trip back through time. Grand Canyon Railway travels a century-old rail line through 65 miles of enchanting ponderosa pine forest, wide-open plains and winding canyons on its way to the South Rim of the world famous Grand Canyon. One of the most thrilling ways to experience the Grand Canyon is from inside a raft floating the Colorado River. Rafting trips down the Colorado can provide both white knuckle thrills and/or leisurely floats, depending upon what type of adventure you are looking for. 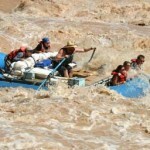 Grand Canyon river rafting trips might be among the most famous and unusual adventures available in the United States. Whitewater raft trips will take you through some of the most spine tingling rapids in the country as the Colorado River cascades through the Grand Canyon. You can choose from raft trips lasting from 3 days to 21 days, but keep in mind that reservations are required well in advance. The Grand Canyon is rated Class IV with few Class V rapids but there are many Class I - III rapids available as well. The range of attributes offered by the Colorado River provides many options for rafters, from a sit-back and relax floating experience where your raft guide does all the paddling, to an intense and unforgettable trip through the rapids where everyone gets involved. Grand Canyon river rafting combines world-class whitewater with breathtaking scenery to make one truly unforgettable river experience. Your raft adventure will begin on the Colorado River at the base of the Glen Canyon Dam. With the dam soaring 583 feet above, you will board a motorized pontoon raft for your 15 mile journey down a calm stretch of the Colorado River. As you float along the smooth waters of the Colorado River, your river guide will share the story of Grand Canyon's soaring sandstone cliffs, timeless rivers and abundant wildlife. Stargazing in Grand Canyon is a popular activity. The lack of light pollution and the blackness of the night sky makes staring at the canopy of stars over head an absolutely remarkable experience. Astronomy within the park is such a popular attraction that there is even an annual event planned around the subject. The Grand Canyon Star Party is held once a year, usually in early summer. All amateur astronomers and the interested public of all ages are invited to come, and you don't even need to bring your own telescope to enjoy the event, although if you have one that you'd like to bring along, it is encouraged. There are many Interpretive Ranger Programs offered through the National Park Service at Grand Canyon National Park. National Park Ranger programs generally last from late May to September. Programs at the South Rim include interpretive tours of Desert View and Indian Garden, as well as trips through Phantom Ranch beneath the canyon rim. North Rim programs include nature walks & history tours offering valuable background information and geology about the Grand Canyon and surrounding area. 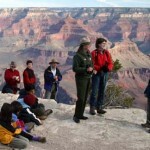 The Grand Canyon ranger programs are totally free of charge and are designed for the enjoyment of the entire family. A great number of historic buildings exist along the south rim of the Grand Canyon. Today, many these buildings house museums, galleries, gift shops and information centers. Standing more than seventy feet tall, the Desert View Watchtower is the highest point on the south rim and provides stunning views of the Painted Desert, the San Francisco Peaks, the Vermilion Cliffs. The walls of the tower are ordained with artistic murals created by Hopi Indian artists and a stairway leads up the center of the tower to the lookout point where visitors can enjoy impressive panoramic views of the canyon and surrounding area. There is also a gift shop located at the watchtower where you can purchase a variety of local Native American handicrafts, including jewelry, rugs, and pottery. Another great spot to enjoy some incredible views of the canyon is at Hermits Rest. 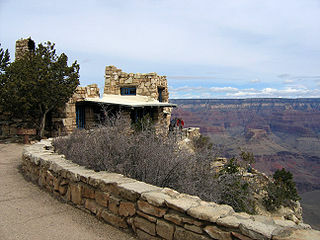 Hermits Rest is a national historic landmark built in 1914 to accommodate travelers to the Grand Canyon. This is a National Historic Landmark and one of many fine examples of Grand Canyon architecture designed by Mary Elizabeth Jane Colter. Hermits Rest contains a snack bar and gift shop where you can find traditional gifts such as park souvenirs, and Native American handicrafts. The Hopi House was the first curio shop set up at the Grand Canyon. The design of the structure was meant to reflect that of a typical Adobe Pueblo used by the Hopi Indians of old Oraibi. The Hopi House is a National Historic Landmark, and has been a favorite destination amongst tourists to the Grand Canyon for purchasing authentic Native American arts and crafts opening its doors in 1904. The second-floor of the Hopi House is a dedicated art gallery which offers a variety of museum-quality items. Hopi House is located on the Canyon rim and open year-round. And hours of operation vary throughout the year. The Kolb Studio started out as the private home of the Ellsworth and Emery Kolb, a team of brothers who were some of the first photographers to document the Grand Canyon on film. The home was built in 1904 and served as the Kolb's place of residence for approximately 22 years. Today the structure serves as a studio, bookstore and auditorium, which is open year-round to the public and features changing art exhibits throughout the year. The studio is located in the Village Historic District, at the Bright Angel trailhead. Hours vary depending on the season. The Lookout Studio was built in 1914 to be a lookout point and a gift shop for visitors to the Grand Canyon. The studio was designed to blend seamlessly into its natural setting along the south rim of the canyon just a short walk from Bright Angel Lodge. The Lookout Studio sells photographs and literature related to the Grand Canyon. You can also purchase rock and fossil specimens, and other traditional souvenirs, books and photographic prints. The Tusayan Museum is considered by the National Park Service (NPS) to be one of the major archeological sites in Arizona and features Pueblo Indian ruins that give you a glance into what life was like at the Grand Canyon more than 800 years ago. Ranger-led tours through the ruins are offered daily and provide great insights into the lives and culture of this ancient civilization. There is also a self guided trail that allows you to tour the area on your own. The Yavapai Observation Station has recently undergone major renovations and is now featuring updated and new exhibits about the fossil record at Grand Canyon and other interpretive displays. The observation Station provides a spectacular panorama of the canyon through large windows. Yavapai Observation Station is a short 5 mile drive north of the park's south entrance, and is just a short walk from the Grand Canyon Village. Yavapai Observation Station is open year-round and the hours vary by season. A free shuttle bus will take you to the Canyon View Visitors Center from Mather Point. You can also walk there, but private automobiles are not permitted. The visitors center is a great place to find information about Grand Canyon National Park and what to do once you are at the park. Guest services at Canyon View Visitors Center include restrooms, pay phones, bookstore and shuttle bus stops. Mule rides down the canyon are an unforgettable opportunity to experience the Grand Canyon the way visitors have been doing it for decades. Both day trips and overnight trips are offered. Day trips run from the Grand Canyon Village to the spectacular Abyss overlook. This trip takes you through Ponderosa Forest and a Piñon and Juniper woodland filled with abundant wildlife. From the Abyss Overlook, you will be able to take photos atop the 3,000 foot vertical drop and marvel at the beauty of the Grand Canyon's many colorful pinnacles, buttes and mesas. Total ride time includes 2 1/2 hours in the saddle and roughly 30 minutes at the Abyss overlook. Trips depart twice daily, through October, and once daily through mid March from the Historic Mule Barn just a short walk from the Bright Angel Lodge. Call a reservations agent for more details: 866.315.2980. Overnight rides stay the night at Phantom Ranch, a rustic oasis nestled deep in the Canyon. The trip includes lunch at Indian Garden before descending down the cliffs of the Inner Gorge, crossing over the Colorado River on the Suspension Bridge, and then a back up Bright Angel Canyon on the north side of the river to Phantom Ranch. The cabins at Phantom Ranch are equipped with bunk beds, sink, toilet, bedding, soap, and towels. Showers are available. Breakfast is served the next morning before the return trip along the South Kaibab Trail, offering a different, and even more unforgettable, ride through the canyon leading you passed some of the most beautiful panoramas in the park. The total ride back is about 10 hours (approx. 18 miles). This service must be reserved and purchased in advance. Call a reservations agent for more details: 866.315.2980. Fishing in the Grand Canyon can be a excellent at times, and weather the fish are biting a lot or a little, fishing in the Grand Canyon on the crystal clear waters of the Colorado River and her tributaries is sure to be an experience that you will never forget. The bright red bands of the Rainbow Trout echo the colors of the cliffs that tower overhead and standing quiet in the solitude of the canyon provides a powerful feeling of peace and tranquility that you'd be hard pressed to find anywhere else on earth. Some of the Southwest's best trout fishing is just upstream of the park's easternmost boundary, between Glen Canyon Dam and Lees Ferry. The best trout fishing inside the park is at the canyon's eastern end, upstream of Phantom Ranch. Fishing in the Grand Canyon is usually best in the fall and winter. Arizona state fishing licenses are required for any fishing in the park. Licenses may be obtained at Canyon Village Marketplace. Hiking Grand Canyon National Park has something for everyone; trails from beginner level dayhikes along the rim through very strenuous multi-day backpacks. If you plan on just doing a day hike in the Grand Canyon, you will not be required to obtain a permit, however permits are required for all overnight/backcountry hiking. Hiking trails in the Grand Canyon can vary from paved, flat and wheelchair friendly all the way to epic trails with 5000+ vertical feet that will take you to the shores of the Colorado River. Most visitors begin and end their hikes from the South Rim. Both the South Rim and the North Rim offer rim trail hikes that have spectacular views of the inner canyon, some on paved trails. Hiking the Rim trails are ideal day hikes. They offer a variety of different views along trails that offer good hiking with little elevation change. The Rim Trail on the South Rim offers vistas along the South Rim; a variety of rim trails are also available through the more heavily forested regions on the North Rim. The Bright Angel trail is a popular one which starts near the Bright Angel Lodge and offers day hikes that range in distance up to 12 miles (round trip). Canyon topography requires that most hikes begin and end at elevations of 7,000 ft / 2,100 m (South Rim) to 8,500 ft / 2,600 m (North Rim). Many people hike a short distance below the rim down into the Grand Canyon's inner canyon. Extreme precaution should be taken however for any hikes which drop beneath the rim into the inner canyon. When tackling the Grand Canyon's inner hiking trails, you should be aware that you will be hiking in a desert climate, so more than anything; you'll want to make sure you have enough water. Many of the visitors who require rescue from the Grand Canyon hiking trails gravely mistake the temperature differences found atop the canyon and at its bottom, and many hikers fail to realize how tired they will already be by the time they decide to ascend back to the top. As with all day hikes, get a reliable weather forecast and dress accordingly, wear sturdy shoes and a brimmed hat, and take a few quarts of water and salty snacks for each person in your party. Climb on a bus or train and enjoy a guided interpretive tour through a wonderland of beauty! A number of tours are available around the park. Hermits Rest Tour – a two-hour narrated motorcoach tour that travels westward eight miles one way along the old wagon road built by the Santa Fe Railway. Desert View Tour – travels east along the Rim of the Grand Canyon, the Colorado River emerges from the depths of the inner gorge and many of its rapids can be viewed. Sunrise Tour – witness the sun rise over the ramparts of the Palisades of the Desert. An inspirational way to begin a day of activities. Sunset Tour – this 1.5 hour tour includes an orientation to the Canyon while you enjoy the sunset at Yaki or Mojave Point, two of the most panoramic South Rim viewpoints. Combination Tour – enjoy the breathtaking Desert View tour along with any west rim tour (Hermits Rest, Sunset or Sunrise) at a special price combination. Railway Express Tour – step back in history and ride in a vintage train, operating between Williams, Arizona and the Grand Canyon.